It Doesn't Matter What The Rules Are! 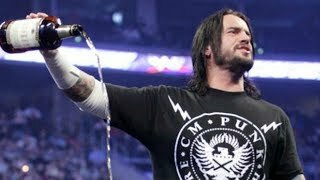 The live crowd in attendance at Monday Night's Raw event were almost privy to the first words uttered by CM Punk through a WWE microphone in over three years. Not because 'The Straight Edge Superstar' was anywhere near the Staples Centre in Los Angeles though. This eye-popping moment was a gift from The Rock, who was addressing the live crowd and responded to chants for the former WWE Champion by first trying to Facetime him, then leaving a voicemail when Punk was apparently out walking his dog. It's not the first time 'The Great One' has taken liberties with his freedom to do and say as he pleases under WWE's roof. There are (rightfully) few with the sway of The Rock, and even then, those VIPs may not escape some of his testier moments without punishment. Furthermore, his innate persona and magnetic connection with the crowd protects him from insults often thrown at other performers, with fans endlessly forgiving of The Rock, too excited for the next word uttered or elbow dropped in his follow-up display.